The tradeoff between high yields and high quality in alfalfa is a quandary that farmers have wrestled with for generations. However, this has become particularly important as dairies have demanded ever higher quality for their higher-producing dairy cows. After all, the average 2013 dairy cow produces >70% more milk than a cow in 1970, and dairies have demanded higher quality forage as a result. This has meant that growers cut at increasingly shorter schedules, often with losses in yield and stand life. But should they? Is the higher quality worth it if you sacrifice yield? Harvest scheduling (days until harvest) is probably the most powerful agronomic practice affecting both yield and quality. Figure 1 shows a wide range of harvests (from early to late over many cuts) in Yolo County, CA, that illustrates this concept. As the crop grows, yields increases (from about 0.5 tons/acre to >2 tons/acre) and quality decreases (from 60% TDN down to 48% TDN-determined by fiber value). Similar changes in digestibility have been observed with harvest schedule. This is termed the ‘yield-quality’ tradeoff. Rarely, if ever, can growers maximize BOTH yield and quality – they must make a compromise which produces ‘high enough’ quality at ‘high enough’ yields. So what is ‘high enough’? A study conducted over 3 years with 18 varieties at Davis, CA showed that yields were increased from about 9.5 to 11.5 tons/acre when we went from an ‘early’ cutting schedule (about 24-25 days) to a ‘late’ cutting schedule (about 35 days) as illustrated in Figure 2. 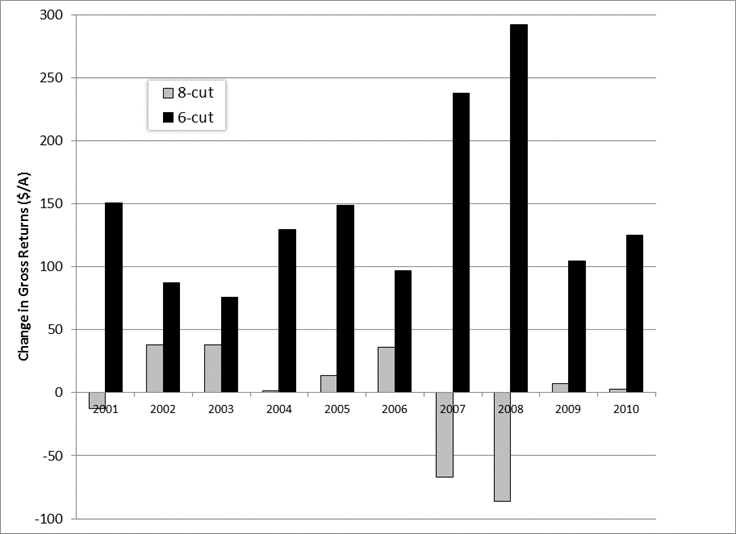 This corresponds to a ‘7 cut system’ vs. a ‘5 cut system’ (Figure 2). However, the short cutting schedule produced a much higher percentage (82%) of higher quality Premium and Supreme hay compared with the longer cutting schedules (39% for the Late Schedule, 50% for the mid). So which one is best? Figure 2. 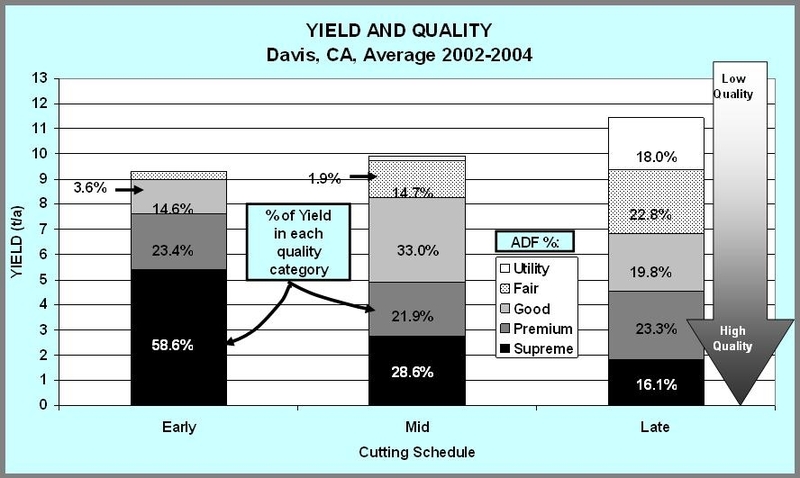 Change in yield and quality over a 3 year period, all cuts, 18 varieties, 3 replications, Davis, CA. Economics. Perhaps it is best to look at this economically, at least for cash-hay growers. 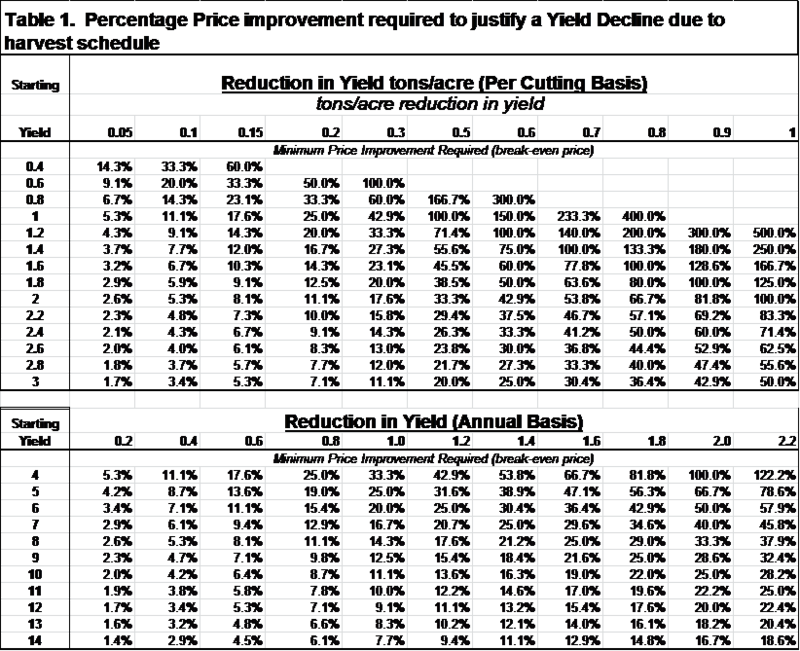 Several years ago, we reported that more times than not, yield is the more important economic factor in the yield-quality tradeoff (see Orloff and Putnam, 2010). Figure 3 shows the gross returns to be superior in a 5 cut system vs. a 7 cut or 6 cut (28 day) schedule at Davis. (See: http://alfalfa.ucdavis.edu/+symposium/proceedings/2010/10-191.pdf for details). Long cutting schedules have the added advantage of lower harvest costs. Figure 3. 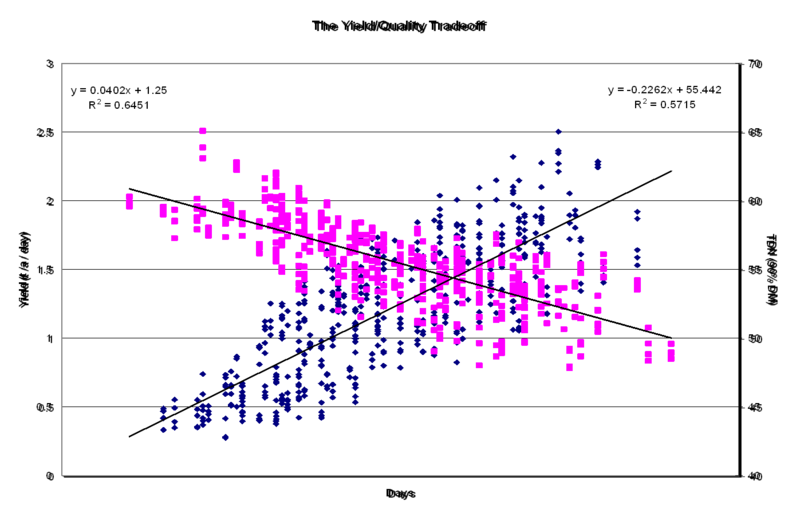 The importance of yield, modelled from cutting schedule data (Figure 2), over a 10-year price result (Orloff & Putnam, 2010). 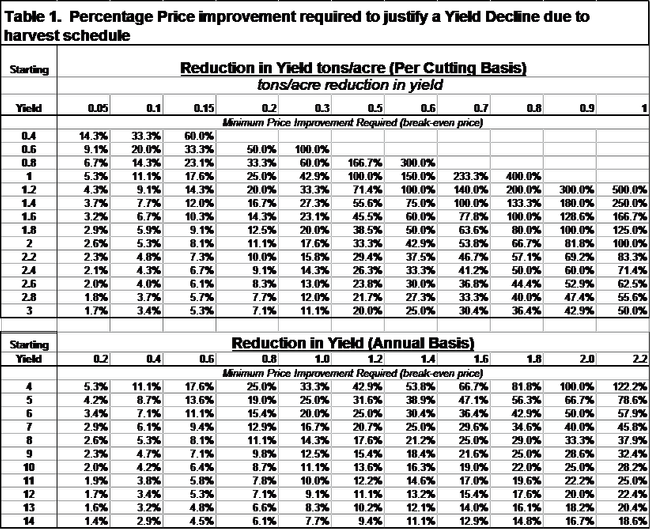 However, one can calculate the necessary value of quality for any situation utilizing the below table (Table 1). For example, if you expect 1.8 tons/acre in a cutting at 32 days, and might see a 0.3 tons/acre reduction when cut at 26 days (1.5 tons/acre per cut) – a reasonable scenario - you should expect a minimum of 20% higher price by making that sacrifice. Thus if ‘normal medium quality hay’ sells for $220, you would need a minimum of $264/ton just to break even if you sacrificed 0.3 ton/acre to obtain higher quality. In another example, if the annual yield potential was about 11.5 tons per acre (as per Figure 2), a 21.1% increase in price would be necessary to justify a 2 tons/acre loss in yield (average of 11 and 12t/a in Table 1). If one believes that such an increase in price due to quality would be GREATER than 21%, then it makes sense to sacrifice the 2 tons/acre/year, if not, cut for yield, not for quality. This doesn’t include other costs, like more frequent harvests/year, weed intrusion or stand decline. These are examples of why growers have often gravitated towards a ‘yield priority’ strategy for their cutting schedules, since yield is likely to be the most important economic factor, year in and year out. However, it’s not so simple. In some markets, lower quality hay often doesn’t even sell, at any price. There is obviously a continuing need to consider quality. So what to do? When considering all of these factors including stand decline and weed intrusion, and the need for high yields, and the high demand for high quality, we have often recommend a ‘mixed’ strategy, of alternating ‘short’ cuts with ‘long’ cuts over the season. The idea here is to provide some quantity of higher-quality forage, along with a stream of higher-yielding but lower quality harvests. A minimum of 2 'long cuts' during the year may be important for stand health. A ‘rest period’ of longer harvest intervals is highly helpful at replenishing root-reserves, and encouraging good re-growth and longer-lived alfalfa stands.